I love saving money when buying trees. However, you do often get what you pay for. So CHEAP often equals POOR QUALITY. Poor quality trees end up looking badly, never being healthy, or just plain DIE. If you consider the time and effort to plant the­­m, even a free tree costs too much if it is just going to die. Therefore buying trees is kind of like adopting a cat from a shelter. Yeah sure, it looks cute and purrs when you hold it, but you really don’t know what you get until you bring it home and find out if it is going to pee all over your furniture. That being said there ARE trees and shrubs that are bargains. For those trees to be bargains though, you want to make sure that they don’t have any of the following three problems. 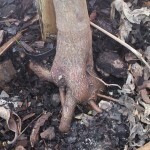 The area where the top most roots go into the trunk is referred to as the root flare. 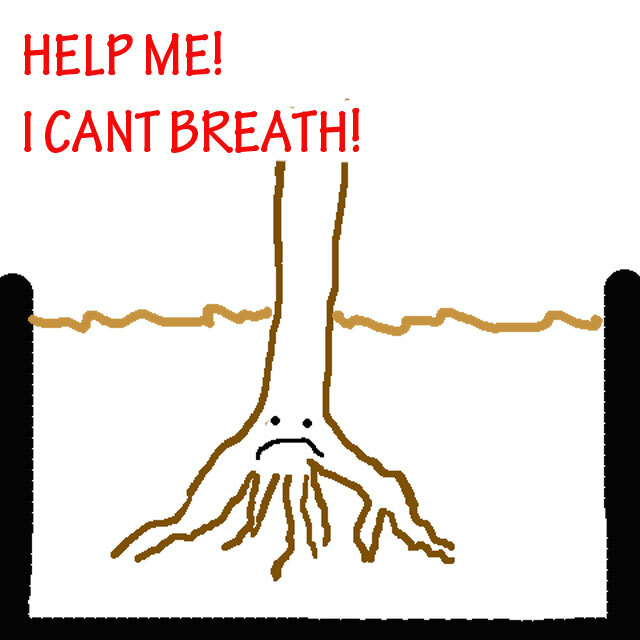 If it is buried too deeply in the root ball, the tree could decline over time due to lack of air for the roots. If the trunk emerges from the soil like a telephone pole, without a visible root flare, then soil should be removed from the trunk base to determine where the root flare is located. The top most major root should be no deeper than one inch from the top of the root ball. Try not to purchase trees that were planted too deeply. If you have already bought one, then you should remove the soil and roots growing above the original root flare. The tree should be planted at or slight higher than this new level. 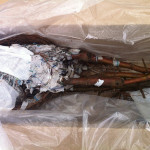 Buying trees with severe circling roots should be avoided. 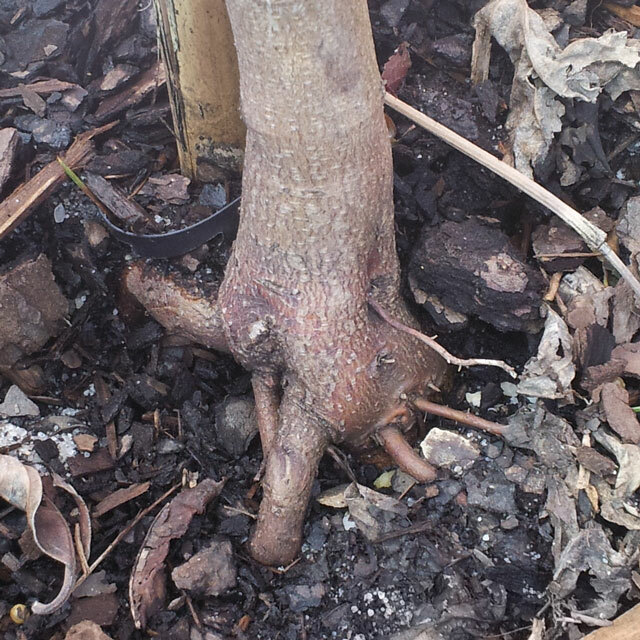 Roots circling close to the trunk can eventually slow growth and girdle the trunk. 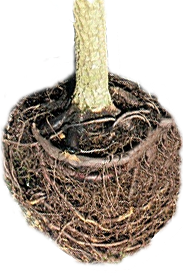 Circling roots at the top of the root ball are especially troublesome. Few roots grow from the outside edges of circling roots, making the tree unstable and likely to blow down during high winds. Root-bound trees have many roots circling around the outside of the root ball. This is caused from the tree growing in the container for too long. 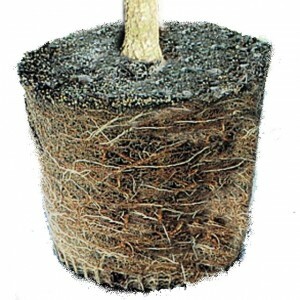 If not corrected, this prevents the tree from spreading roots into the landscape soil after planting. You should usually avoid root bound trees, but you can take give them a try if you are getting real good deal (with a warranty). All these roots should be cut when trees are planted into the landscape. I am brutal when I do this. When the plant is really root bound, I might use scissors and cut off an inch of the entire layer of roots. Don’t be timid. Most places give you a one year warranty when buying trees. Better to cut off a lot of roots and possibly kill it right away, then to have problems later when these roots strangle the tree. There is a quick test you can perform to check root quality in trees. If you push on the trunk at about shoulder height back and forth, the trunk on a good quality tree will bend along its length and will be firm in the pot or the root ball. The tree with a major defect in root system will often swivel at its base and lean over before it bends. 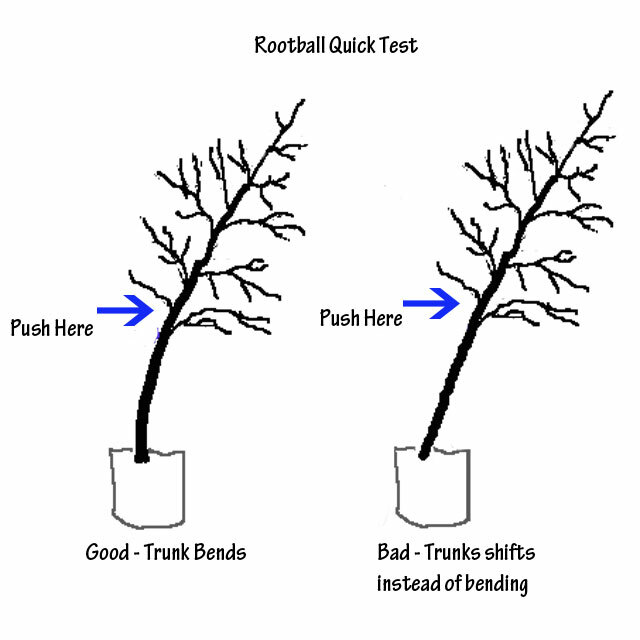 Passing this test does not means the tree does not have root defects. 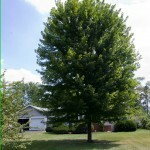 It can rule out severe faults close to the trunk when buying trees. 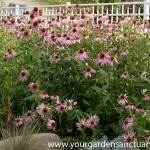 Here is a related post on the best time to move different trees and shrubs. Great post — very helpful. In creating a new forest on the hillside behind our house, I have bought many 2 gallon and 5 gallon “bargain” trees, and they have had all three of these problems. I open the roots of the rootbound pots and the pots planted too deeply by taking the tree out of its container and using a strong spray from the hose all over the roots, washing the soil off. I wind up with an almost bareroot plant at the point of transplanting it. So far my forest is growing well from these “rescues”. The circling roots are more of a problem and sometimes can’t be fixed. Good to know about the bendy trunk test! That is a great insight. By washing away all of the soil you are in effect making it a bare root tree. This allows you to see all the defective roots you should cut out. For the record, Bob Anderson, our adopted shelter cat is a very good cat. He greets and waits for us at the window and sleeps with me cozily. 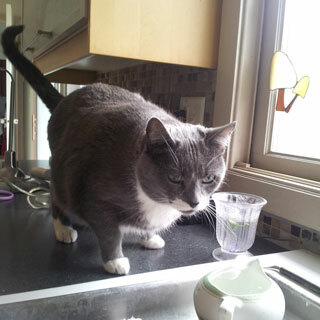 Sure, he likes to drink from the china gravy bowl kept on top of the sink, but wouldn’t you if you had a choice? I’ve been told the best way to deal with root bound trees and shrubs is to cut four sides so you end up with a square root ball. I like the tree test, will try that in the future. I have heard that advice too and have used the “cut it into a square” method myself. Seems to work well, just don’t forget about the bottom of the root ball. My husband and I want to buy some trees to plant in our yard, but we have never bought any before and don’t know how to find healthy ones. That is good to know that we shouldn’t buy trees with circling roots! We wouldn’t want the roots to grow around the trunk later on and cause issues! Thank you for all the tips!